Grand Cayman is apart of the island chain, Cayman Islands. It is the largest of the three and home to the famous stingray city! Grand Cayman is located in the Caribbean just south of Cuba. It holds pristine beaches, endless animal life, and a unique island culture. If you are looking for a place to stay, All The Rooms is a travel website that combines all the major sites to find you a great deal. It’s kind of like Sky Scanner but for hotels/hostels/vacation rentals! Here is the link for Grand Cayman specifically. Day 1: Long, Dreadful Flight! 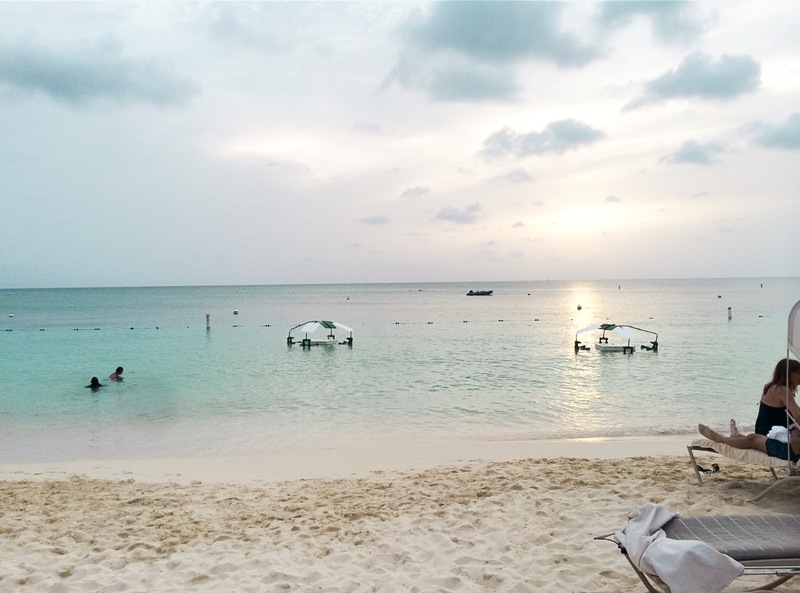 Unfortunately, there is no quick way to get to Grand Cayman because it is such a small island and there are very few, if any, direct flights. Luckily I was already in Florida visiting my sister but we STILL had one stop before arriving… in Florida… You could practically swim there it’s so close. Well, not really, but you get the point! We stayed in a hotel along 7 Mile Beach. The island is very small and narrow so most hotels will be located along this stretch of beach. What better way to get rid of jet lag than sitting on a powdery white beach with your toes in glittery turquoise water? To celebrate our first night there, we walked along 7 Mile Beach and stopped in at the Ritz-Carlton hotel. There I had the best sushi of my life – Taikun. If you like sushi, I highly recommend treating yourself there! I am a complete animal lover so of course, seeing turtles up close, getting the opportunity to hold a baby turtle, and snorkeling with fish always seems like a great time! They also do a lot of research and conservation. If you decide to go, you will learn a lot about the process from when they hatch their eggs to reaching the ocean. They also have a large snorkeling pool where you can swim with fish, see a crocodile named smiley, go to an aviary with endless amounts of birds, & get into tanks where you can hold a little baby turtle! Stingray City is a sandbar in the middle of the ocean where hundreds of stingrays gather at all times of the day. A very long time ago, fisherman would stop at this sandbar to clean their catches of the day. They would throw overboard whatever they did not want to keep and feed to the stingrays. Long story short, the stingrays have been coming there ever since! TIP: Do NOT watch stingray attack videos minutes before heading over to stingray city, ha! The jet ski ride out was very choppy at high tide. The ride is fairly long so your hands will be cramping if you are cutting through big waves! The sand bar during low tide looked magical. You are in knee-deep water in the middle of the Caribbean sea! If you go during high tide, you can still stand up fine but you are in shoulder deep water. When a wave comes, it picks you up and places you a couple of feet backwards – which can be kind of scary with giant stingrays swimming all around you… and especially scary if you just finished watching stingray attack videos! You have the option to do a full day tour where you can see starfish point, rum point & sting ray city all in one shot! While my description above does not seem very convincing, I promise you it was a memory that will be hard to beat! Standing in the middle of a sandbar surrounded by friendly, wild stingrays is bucket list material! Head over to quaint downtown area that is right on the water. Here you can do souvenir shopping, lunch, and tours! We did a submarine tour where you can see the coral reefs & schools of fish all up close and personal! The town is small so you can get through everything in just a couple of hours. If you like wine, who am I kidding – who doesn’t like wine!? Don’t forget to stop in West Indies Wine bar for some yummy wine tasting! You can rent jet skis from almost any of the hotels along 7 mile beach. They let you take them right out into the ocean for a few hours. TIP: Be careful of the wild sea turtles, they are everywhere and can be easily hit by your jet ski if you’re not looking out for them! We spend the remainder of the day relaxing on the beach and at the swim up pool bar at our hotel. Such a relaxing day before leaving this paradise! The saddest day is always the day you have to leave! I already can’t wait to go back and explore the other two islands. BONUS TIP: If you like to scuba dive, the Cayman Islands are famous for wonderful scuba diving! I would definitely check it out if you have an extra day and are already certified!